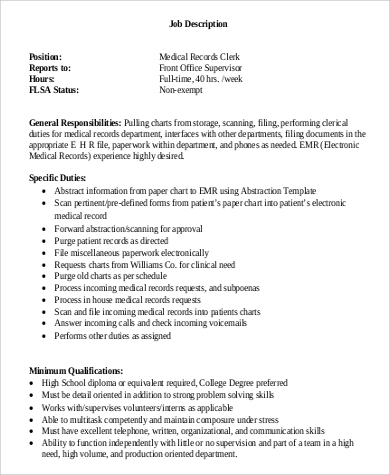 Job opportunities in health care come aplenty. Health care is considered a perpetual need, and there will never be a shortage in its demand. Essentially, the field of medicine has a very intrapersonal nature. Communication is what bridges providers to patients, and vice versa. 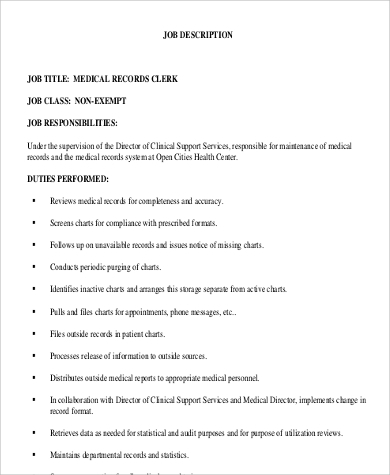 If you are very much interested to be of service to patients, but you are not very comfortable and adept with intrapersonal interactions, then consider the job of a medical records clerk. It is not a problem. Rapport is not a skill that everyone is born with, and there are a lot of people like you who prefer to work at back-end, supporting roles, with duties that are integral to the efficient function of your colleagues. 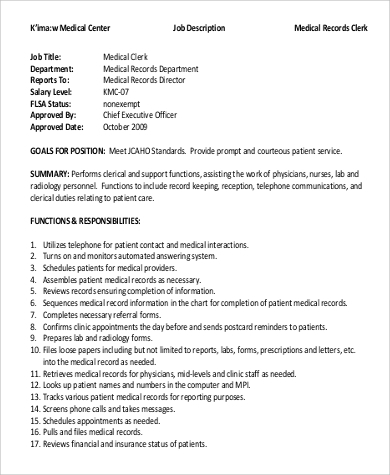 If your interest has been piqued, see these Job Description Samples for an idea of what health care employers expect of the position. 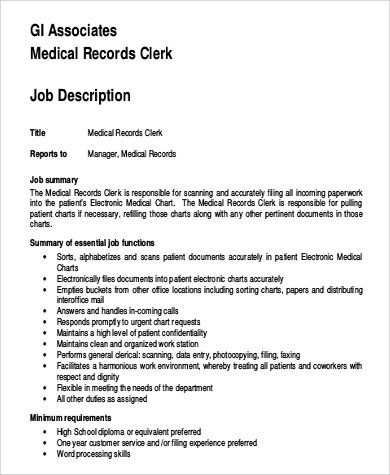 Also known as a health information technician or medical records technician, a medical records clerk is responsible for the repository of all patient information in health care facilities. It is akin to the work of a librarian. A high school diploma is the minimum requirement. To better your chances, you could enroll in a credentialing programs on health information and management. This is usually offered by accredited institutions and technical, community, or vocational colleges. Completion hereto is preferred by employers. Courses typically cover the following programs. Additionally, you can supplement your credentials with certification at your area’s overseeing institution on health information and coding registry services, if available. You are expected to perform well under pressure, which is characteristic to hospitals and to health care, in general. forwarding patient information to physicians. 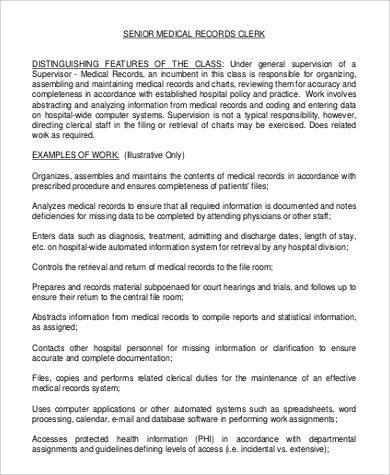 In the absence of a medical coder in the office, you will also have to do all clinical coding. Every illness, diagnosis, and etc., corresponds to a code that come from standardized sets. 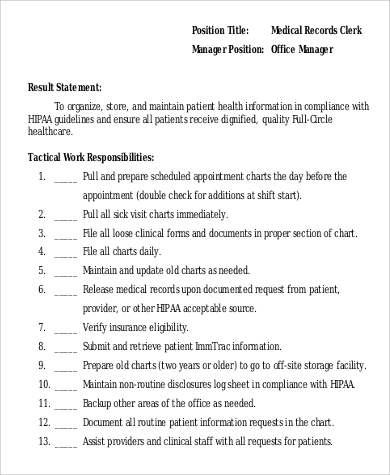 These codes are universally used and understood; an introduction of the modern health care system for efficiency and streamlining of medical office work. 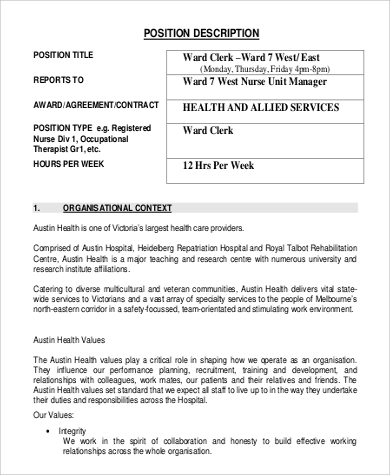 Accumulated experience, or admission into higher levels of coursework on health information and management may later land you a supervisory role. 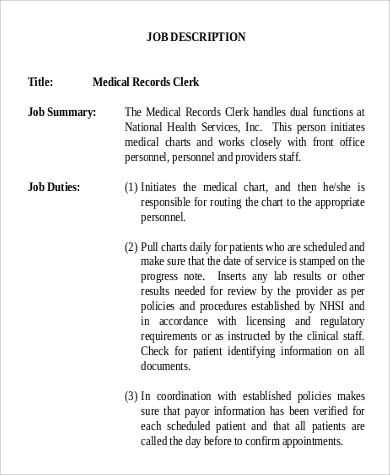 You could progress to becoming a medical records manager, a medical receptionist, or a medical assistant with the necessary education and credentialing. 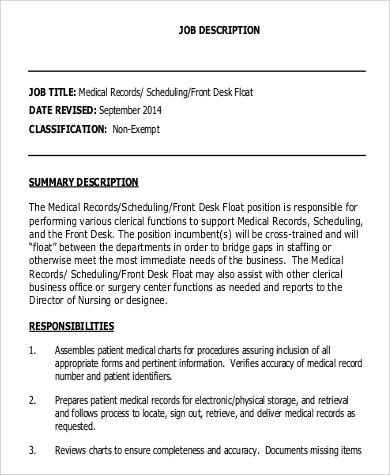 For more on the latter, see these Medical Assistant Job Description Samples. Clerks in every type of trade perform essential clerical responsibilities for the overall function of their offices, but with particularization to their field. 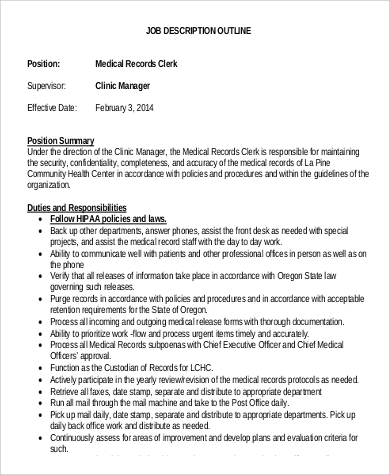 For information on clerks at various offices, see these Office Clerk Job Description Samples.